FREE content-packed ebook reveals how to build a website, bring relevant traffic to it and convert your website visitors into paying customers OVERNIGHT! Download this FREE ebook – enter your name and email in the form to the right which contains more than 60 resource links for all of the sections below. These are the same tools we use when we provide these services to our clients. Complete the form at the top-right now to discuss using our traffic and conversions service and increase your sales today. You can start having these results this week! Give us your name and email and and we'll immediately send your Traffic & Conversions white paper with all you need for a successful website. I would highly recommend Michael Cordova as an expert in website search engine optimization, web design and web development. 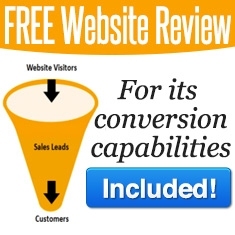 Michael is the best SEO / Internet marketing consultant I've ever met. His work to optimize the TransMagic website not only produced an 8-fold increase in lead generation, but it also stood the test of time. Recently Michael helped us to re-do our website and SEO to take advantage of more sophisticated techniques in his knowledge base. I have been working with 21st Century on my SEO work for well over a year and the results are larger prospects and bigger opportunities for my company.